Quarterly per saltire: Pseudonym without anonymity. A Unicorn per saltire Or and Sable, salient. 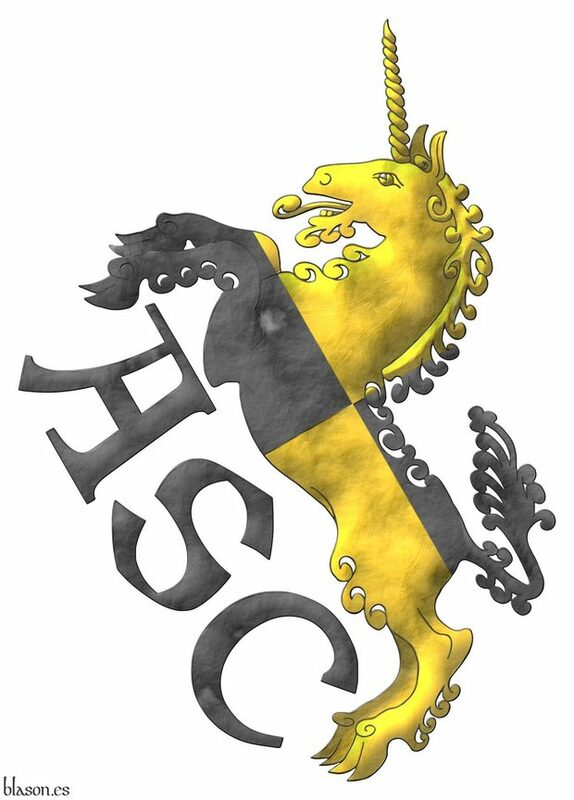 Motto: «ASC» Sable, in bend, between the hoofs. Badge created with: the unicorn and the motto painted with flat color sable and metal or; and the whole set with an old parchment finish. 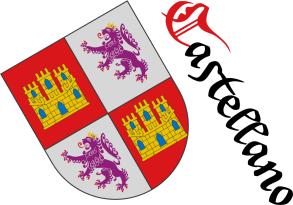 The original design of this badge, along with other coats of arms and heraldic pieces, is registered as intellectual property in [Salmerón Cabañas, A.; 2015a; page 9]. Additionally this badge with a Unicorn per saltire Or and Sable, is used as what the Intellectual Property Registry calls a «pseudonym without anonymity» to sign documents. Blazon keywords: Quarterly per saltire, Sable, Or, Unicorn, Salient, Motto (identification), In bend and Hoof. Style keywords: Spot ink and Old parchment. Classification: Badge, Created and Personal. Eagle, Tree, Acorn, Arm, Owl, Horse, Head, Crescent, Heart, Raven, Tooth, Elephant, Mullet, Male figure, Fleur de lis, Fleuretty, Ash, Boar, Lion, Leopard, Wolf, Hand, Martlet, Wing, Hoof, Quill, Cinquefoil, Branch, Oak, Rose, Double rose, Bull, Tulip and Escallop. Ace of spades, Non-classic artifact, Castle, Clarion, Cross, Sword, Scroll, Buckle, Letter, Book, Menorah, Number, Piano, Chess rooks, Compass rose, Tower and Trident. Angel, Dragon, Phoenix, Saint George, Triton and Unicorn. Old parchment, Created, Quarterly per saltire, Motto (identification), In bend, Personal, Badge, Or, Hoof, Sable, Salmerón Cabañas, Antonio, Salient, Spot ink and Unicorn.